Raines returned to the big leagues in 2001 and played for the Expos, Orioles and Marlins during two his final two seasons. On a minor league rehab assignment for a shoulder injury, Raines and his son, Tim Raines Jr., became the first father-son pair to play against each other in a professional game. Later that year, he played with his son for the Baltimore Orioles. TIM RAINES IS THE ONLY PLAYER IN BASEBALL HISTORY TO STEAL AT LEAST 70 BASES IN SIX CONSECUTIVE SEASONS (1981-86). Timothy Raines Sr. (born September 16, 1959), nicknamed “Rock”, is an American professional baseball coach and former player. He played as a left fielder in Major League Baseball for six teams from 1979 to 2002 and was best known for his 13 seasons with the Montreal Expos. He is regarded as one of the best leadoff hitters and baserunners in baseball history. In 2013, Raines began working in the Toronto Blue Jays organization as a roving outfield and baserunning instructor. 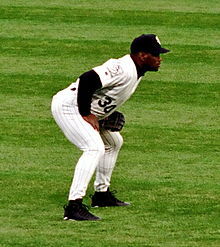 Raines is the 1986 NL batting champion, a seven-time All-Star, and four-time stolen base champion. He was elected to the Hall of Fame on January 18, 2017. The Montreal Expos selected Raines in the fifth round of the 1977 Major League Baseball draft. After debuting with six games as a pinch runner in 1979, he played briefly as a second baseman for the Expos in 1980 but soon switched to playing the outfield, and rapidly became a fan favorite due to his aggressiveness on the basepaths. In the strike-interrupted 1981 rookie season, he batted .304 and set a then Major League Baseball rookie record with 71 stolen bases, breaking the previous mark of 56 steals set by Gene Richards in 1977. Raines was caught stealing for the first time in 1981, after having begun his career with a major league record 27 consecutive successful stolen bases. Raines was the runner-up for the National League’s Rookie of the Year Award in 1981, which was won by Los Angeles Dodgers pitcher Fernando Valenzuela. In 1983, Raines stole a career high of 90 bases, the second-highest total in franchise history, and scored 133 runs, a franchise record. He was named Expos Player of the Year in 1983, 1985, and 1986. In each season from 1981 to 1986, Raines stole at least 70 bases. He had a career-high .334 batting average in 1986, winning the National League Batting Championship. Raines maintained a consistently high on-base percentage during this period and a rising slugging percentage, reaching a career peak of .429 in 1987. Although he never won a Gold Glove Award, Raines was an excellent defensive player who led the National League with 21 assists in 1983 and, with 4 double plays, tied for the league lead in double plays by an outfielder in 1985. Raines became a free agent on November 12, 1986, but in spite of his league-leading play, no team made a serious attempt to sign him. (During this period, the Major League Baseball owners acted in collusion to keep salaries down.) On May 1, 1987, hours after being permitted to negotiate again with Montreal, Raines signed a new deal with the Expos for $5,000,000 over three years, and a $900,000 signing bonus. In his first game back, on May 2, facing the Mets, although Raines had not participated in spring training or any other competitive preparation for the season, he hit the first pitch he saw off the right-field wall for a triple. Raines finished the game with four hits in five at-bats, three runs, one walk, a stolen base, and a game-winning grand slam in the 10th inning. Even without having played in April, Raines led the Expos in runs, walks, times on base, runs created, and stolen bases, in addition to batting average, on-base percentage, and slugging percentage. He also garnered MVP honors in the All-Star Game as he delivered a game-winning triple in the 13th inning. Raines would, in 1992, be one of dozens of players retroactively awarded collusion damages, receiving over $865,000. The Expos traded Raines to the Chicago White Sox on December 20, 1990, along with Jeff Carter and a player to be named later (PTBNL), later identified as Mario Brito, in exchange for Iván Calderón and Barry Jones. In his first season in the American League, Raines hit for a .268 average but with a .359 on-base percentage; he was second on the team in runs scored as the White Sox finished the season in second place in the American League Western Division. His average improved in 1992 to .294 with a .380 on-base percentage. In 1993, despite missing nearly six weeks in April and May due to a torn ligament in his thumb he suffered while stealing a base, he managed to hit .306 with 16 home runs as the White Sox won the American League Western Division title. In the 1993 American League Championship Series against the Toronto Blue Jays, Raines posted a .444 batting average and scored five runs in a losing cause. On December 28, 1995, the White Sox traded Raines to the New York Yankees for future considerations; in February 1996, the teams agreed on Blaise Kozeniewski as the return. With the Yankees, Raines received two World Series rings in 1996and 1998. While his playing time was curtailed due to injuries, he contributed to a loose clubhouse atmosphere, and was productive when he came up to the plate. Raines was signed by the Yankees as a free agent on February 1, 2000, but was released on March 23. On December 21, Raines was signed by the Expos. At the Expos home opener in 2001, Raines received what he described as the longest and loudest standing ovation in his entire career, resulting in the pitcher walking him on four pitches. With limited playing time, Raines batted .308, with a .433 on-base percentage and a .436 slugging percentage. That same year, he was inducted into the team’s Hall of Fame. Raines underwent surgery on May 31 due to a left shoulder strain, and spent time rehabilitating with the Expos Triple-A club, the Ottawa Lynx. 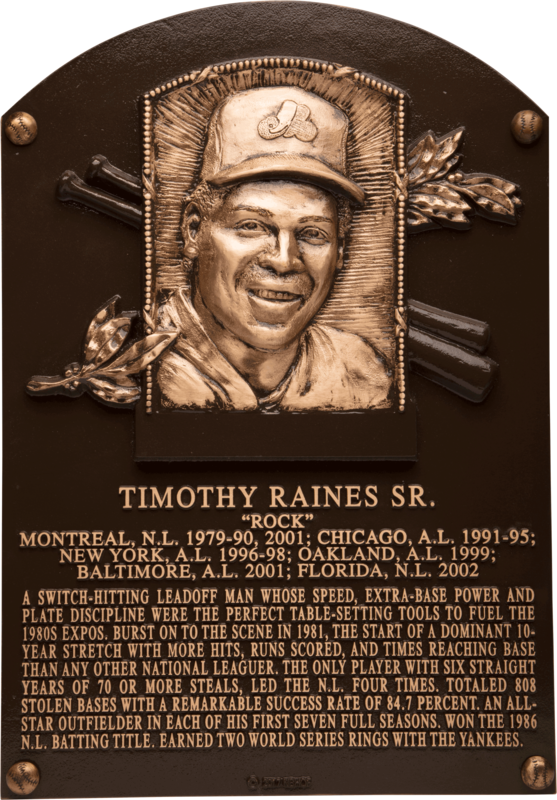 On August 21, 2001, Raines and his son, Tim Raines, Jr., became the first father-son pair to play against each other in an official professional baseball game, when the Lynx played theRochester Red Wings (the two had faced each other earlier in the year during spring training). Raines returned to the major league club on August 22. Baltimore Orioles Tim Raines Jr., right, and his father Tim Raines of the Montreal Expos meet with the media at the Orioles training camp in Fort Lauderdale, Fla .Tuesday, March 6, 2001 prior to a spring training game. Father and son each had an RBI hit in their first at bat in the game. With 808 steals in his career, Raines has the fourth-highest total in major league history, behind Rickey Henderson, Lou Brock and Ty Cobb. Until 2008, His career stolen base percentage (84.7%) was the highest in major league history for players with 300 or more attempts, and he was successful on 40 consecutive steal attempts between July 1993 and August 1995, setting an American League record at the time (the record was broken by Ichiro Suzuki in May 2007, when he completed 45 consecutive steals). Among switch hitters, Raines ranks sixth in career hits (2,605), fourth in runs (1,571), walks (1,330) and times on base (3,977), fifth in plate appearances (10,359), seventh in singles (1,892), doubles (430), total bases (3,771) and at bats (8,872), eighth in triples (113) and tenth in extra base hits (713). He holdsExpos/Washington Nationals franchise records for career runs (947), steals (635), singles (1,163), triples (82) and walks (793), and was the seventh player whose career began after 1945 to retire with over 1,500 runs and 100 triples. His 1,966 games in left field ranked seventh in major league history when he retired. From 1983 to 1987, Total Baseball rated him as one of the National League’s five best players each season. He is also listed as the 40th greatest non-pitcher in major-league history according to Bill James‘s win shares formula. Raines’ uniform number 30 was retired by the Montreal Expos. In 2017, Raines was elected in the National Baseball Hall of Fame and Museum. Raines was elected to the Hall of Fame in 2017, appearing on 86.0% of ballots cast. He was eligible for election to the Baseball Hall of Fame in January 2008, and various sabermetricians and commentators had supported his induction prior to his being elected in 2017. Raines began his coaching career in 2003 as manager of the Class A-Advanced Brevard County Manatees affiliate of the Expos. He was promoted to the major league team in 2004 and was present for the Expos’ final games as a Montreal franchise. In 1985, Raines became a resident of Heathrow, Florida. In 2007, he moved to Estrella Mountain Ranch, a suburb of Phoenix, Arizona, and married Shannon Watson from Arnprior, Ontario. She had twin babies in 2010. IT’S OFFICIAL, STEPHEN STRASBURG, OF THE WASHINGTON NATIONALS, WILL HAVE TO HAVE THE “TOMMY JOHN” SURGERY. Michael Jordan, Starring in “THE LAST DANCE”, A 10-hour Netflix documentary In 2019 Of The Greatest Basketball Player Of All Time, And The Only NBA Player Too Become A Multi-Billionaire After Retiring From The Sport.